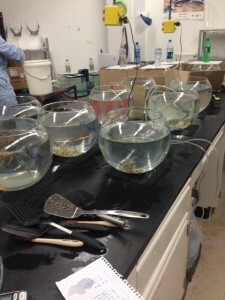 In the lab, Kelly wanted to see how the pesticide Malathion that the city of Corpus Christi sprays every four days for mosquitoes affected the crabs when they were given two doses in 8 days. 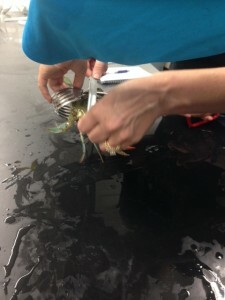 We separated the crabs into three groups: acute, control, and treatment. 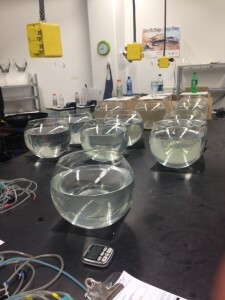 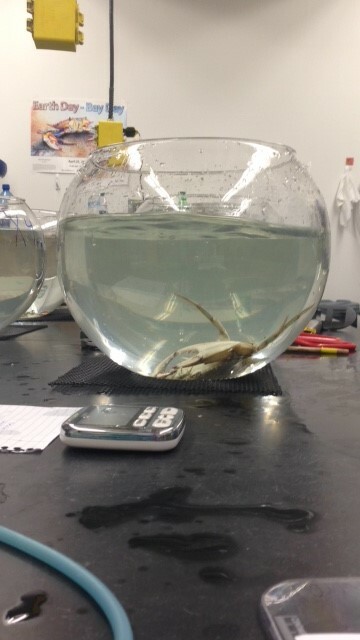 The control crabs did not receive any dose of Malathion, but were kept in the same type of glass bowls as the others for comparison. 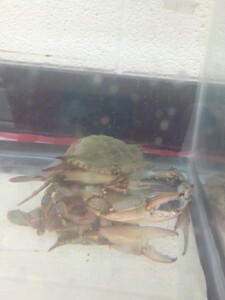 The acute crabs received one dose, and the treatment crabs received 2 doses. 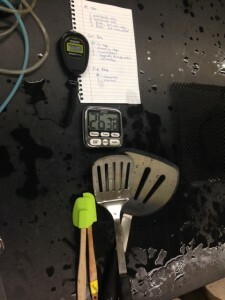 Every twelve hours, Kelly flipped the crabs over on their backs using two spatulas to time how long it took to flip them, and how long it took for them to flip themselves back over. Then, she noted their behavior during the flipping and measured to see if their eyes retracted or not when she waved a mini rubber spatula near them. 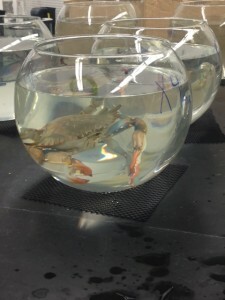 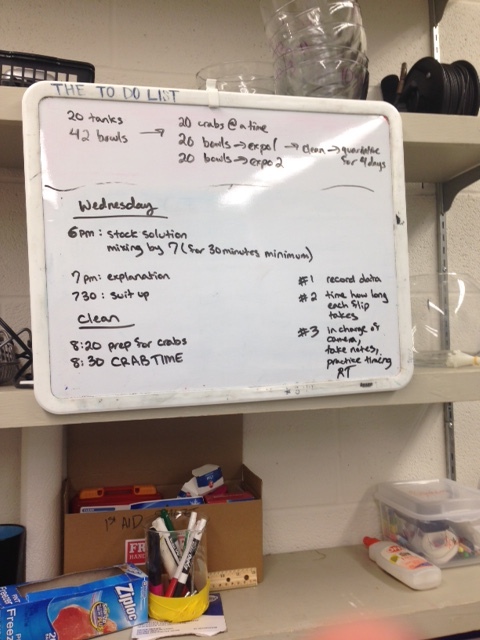 After eight days, all of the crabs were taken to the hatchery where Kelly had a flume that had two pathways for the crab to choose from: the one with food, and the other without food. 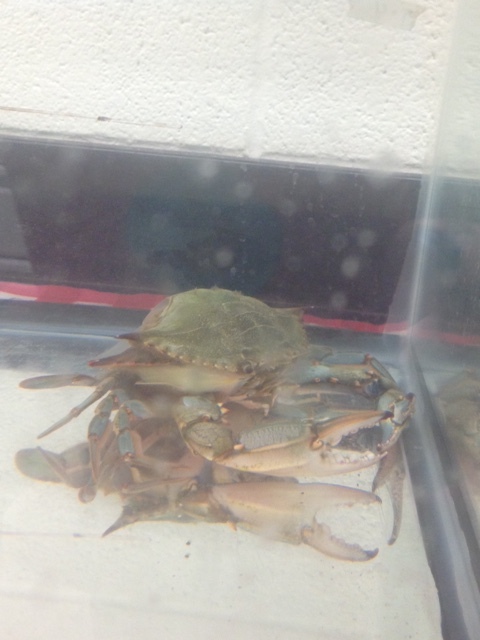 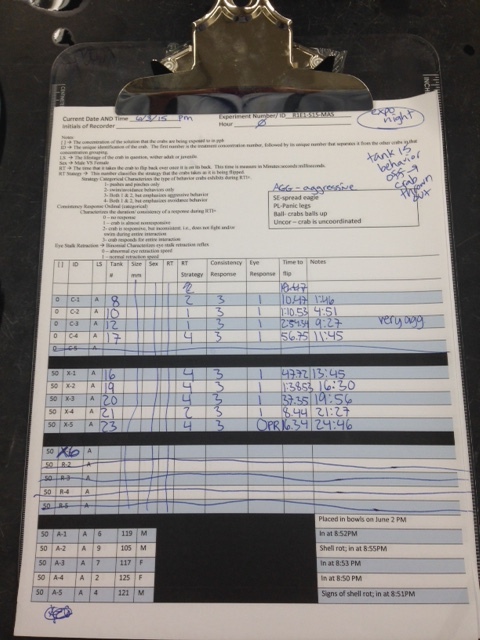 This was to see if the Malathion affected the crabs in finding and tracking their food source. 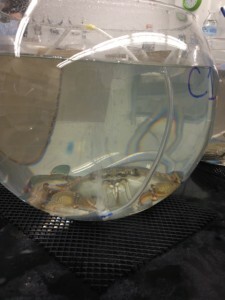 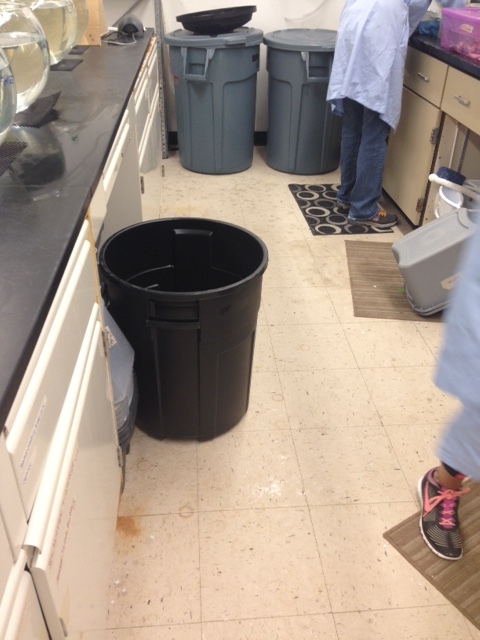 Overall, the crabs that were treated with Malathion behaved differently than the control crabs. 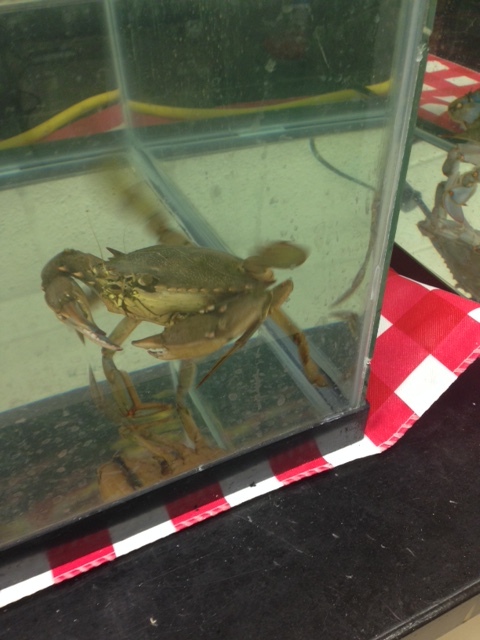 The treatment crabs were less aggressive, and acted more carefree. 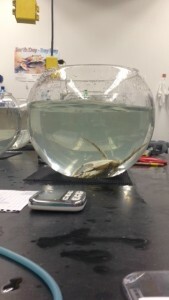 Their eyes did not retract normally, and it was harder for them to track the shrimp, if they even tracked it at all. 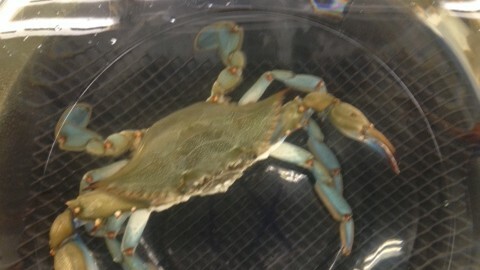 Swimmerettes: The very back legs on a blue crab that look like paddles and allow it to propel itself while swimming. 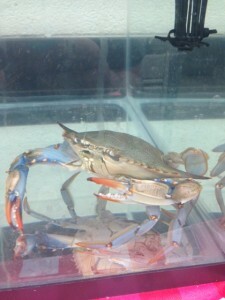 Fun Fact: When a crab feels threatened, it can eject its legs so that it can get away if caught. Crabs molt just like a snake sheds. How many days does it take for the effects of Malathion to wear off? Since predators can more easily attack the crabs when they are affected by the Malathion, is the blue crab population becoming endangered? If an adolescent crab loses its claw, can it grow back? 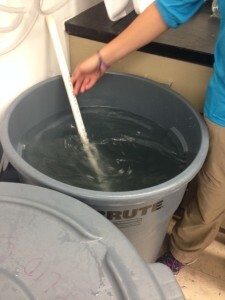 (B) describe and relate responses in organisms that may result from internal stimuli such as wilting in plants and fever or vomiting in animals that allow them to maintain balance. 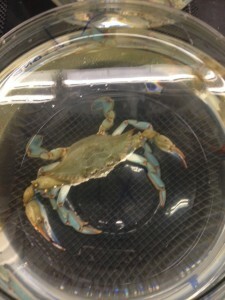 Show two videos: 1 of treatment crab, and 1 of control crab. Explain why the change in behavior in the treatment crab puts it in a state of distress, and why this is bad for its survival. 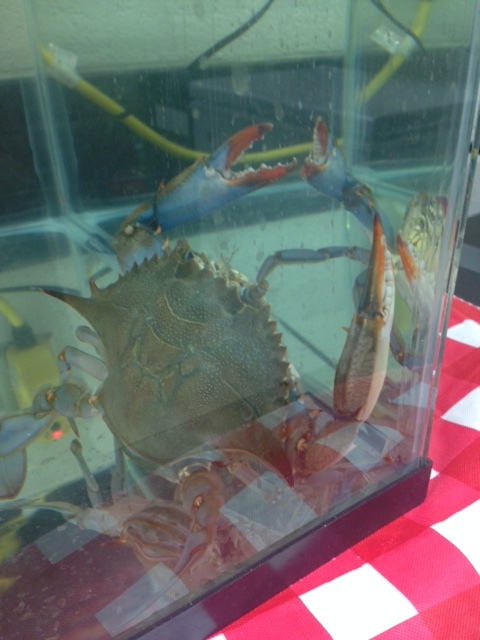 If allowed, maybe bring in examples of the two crabs, and show the kids in person.